Foosball Table Setup - Find different ways how you can do it! The prospect of owning a foosball table is exciting especially if you have been anxious to learn the game. If you are an ardent lover of foosball and want to have a game table in your home it is about time you get one. No lover of foosball should be without a foosball table for their enjoyment. Today you’ll learn the foosball table setup. Should you choose to get a secondhand table you will not have the issues of setting it up, but if you choose to buy one from Amazon you will need to know how to set it up; so here are the details of setting up your new foosball table. For anyone, the prospect of foosball table setup can be daunting and yet exciting. The package generally comes with the instructions, so you are able to follow clearly. If you are not a technical person; like me, then it is really advised to get help from someone who is able to help you and both of you will be able to make an easy work of it. The table comes with many parts of playing men, Rods, bearings, legs, handles, pins, scoring unit, table frame which may come preassembled, while other foosball table manufacturers will package the whole table in pieces for you to assemble. For persons who do not wish to have the challenge of assembling the table themselves, Amazon offers a package which will get you a professional to do the job for you. By their standards, the assembly time is about two hours so if you are willing to wait for that length of time. My suggestion is to use the professional as he or she will be able to do the job in record time; and have you not redoing any assembling you have done wrong, which can be frustrating. Here is the link to the service which by all recommendations of persons who have used them, are very pleased. Because it is easier to have a pro do the work, it gives you more time to enjoy the play. The service has gotten a 5-star rating from 99% of verified purchasers, so indeed, there are many satisfied customers. It is advised though to have the assembly done in the area you will use the table, especially if the table is one of a Tornado Tournament 3000 or the Warrior Professional which are between 200 to over 300 pounds. Movement of these size tables will incur additional cost as the assembly does not include movement. Smaller foosball tables like the Westminster 2479, which weighs only two pounds, still requires set up. This is easy to move so assembly can be done anywhere. This Franklin 48 Inch foosball table is considered a very sturdy 26 pounder, which is relatively easy to assemble, based on the tutorial. So, having decided to do the foosball table setup on your own, I consider you a very brave soul. Many have done so with misses and having to reassemble certain parts because they have not read or clearly understood the instructions. 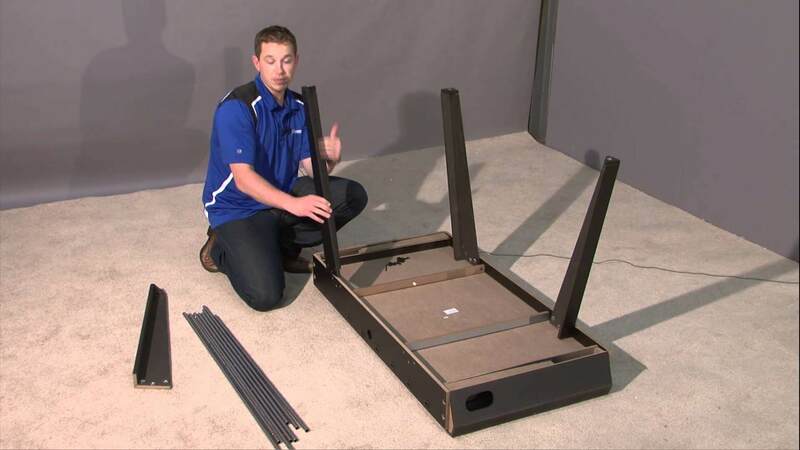 After you have received the delivery of the foosball table it is important to verify all parts are in the box. Double check and if all the pieces are there, then begin. I suggest you do the set up in the room you will play foosball if the table you have bought is very heavy. This will take a lot of pressure from you to move after assembling. As suggested by most experts, you start with setting up the legs to the cabinet. This is done by flipping the cabinet over on the top. By reading the manual the instructions will tell you what bolt and screw go where. After setting the legs in place, then turn over the table, as this will make it easier to put the rods and playing men in place. Inserting the rods completely is done after you have positioned the playing men on the rods in the correct way. There may be some confusion as to the correct rod for where, but the manual will indicate. This is because a team with 3 man goalie is different from a one-man goalie, which will be indicated by the amount of spacing and the rod lengths. Offence rods are also made longer lengths so knowing the difference is important; especially if you are learning the game for the first time. Many trial and errors have gone into setting up a foosball table. Besides the manual for set up of a foosball table, there needs to be some knowledge of tool mechanics. 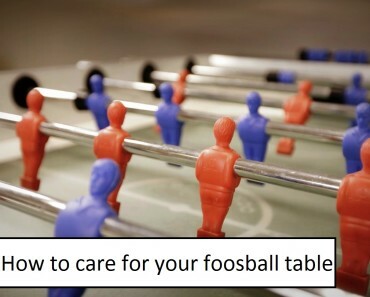 Many persons that have purchased a foosball table and opted to do their own assembly have stated that some of the manufacturer’s instructions and specifications have not been generally accurate, so they have to resort to the trusty drill, duct tape, glue, or any tool that will help on the job at hand. The manufacturers will package the package but minus some tools that are needed. This is why it is very important to check and double check to see if everything that is stated on the outer package is there. Foosball table setup is a thing that I would not want to go through with all the issues of assembly, so I would get professional help, which Amazon is only too happy to give. However, if you are a very adventurous type, doing it by yourself is also ok; because a challenge at foosball is just the ticket to enjoying your new foosball table. 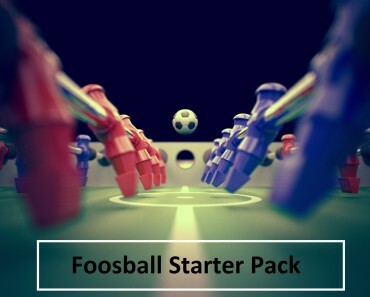 What Should Every Foosball Player have!